This resource is designed to be the best free guide to financial modelingWhat is Financial ModelingFinancial modeling is performed in Excel to forecast a company's financial performance. Overview of what is financial modeling, how & why to build a model. A 3 statement model links income statement, balance sheet, and cash flow statement. More advanced types of financial models are built for valuation, plannnig, and! We will break down the most important aspects of various types of financial modelsTypes of Financial ModelsThe most common types of financial models include: 3 statement model, DCF model, M&A model, LBO model, budget model. Discover the top 10 types of Excel models in this detailed guide, including images and examples of each. Financial modeling is performed for many reasons including to value a business, raise money and provide numerous tips and tricks with industry-leading best practices. Learn to build a model yourself with this free financial modeling guide. CFI’s mission is to help anyone become a world-class financial analystThe Analyst Trifecta® GuideThe ultimate guide on how to be a world-class financial analyst. Do you want to be a world-class financial analyst? Are you looking to follow industry-leading best practices and stand out from the crowd? Our process, called The Analyst Trifecta® consists of analytics, presentation & soft skills. With that goal in mind, we’ve designed this guide to be extremely practical with specific takeaways that can help you improve your financial modeling skills. What Will this Financial Modeling Guide Cover? All of these topics are covered in more detail in CFI’s online financial modeling courses. For anyone pursuing or advancing a career in corporate developmentCorporate Development Career PathCorporate Development jobs include executing mergers, acquisitions, divestitures & capital raising in-house for a corporation. Corporate development ("corp dev") is responsible for executing mergers, acquisitions, divestitures and capital raising in-house for a corporation. Explore the career path., investment bankingInvestment Banking Career PathInvestment banking career guide - plan your IB career path. Learn about investment banking salaries, how to get hired, and what to do after a career in IB. The investment banking division (IBD) helps governments, corporations, and institutions raise capital and complete mergers and acquisitions (M&A). Analysts work 100, financial planning, and analysis (FP&AFP&A AnalystBecome an FP&A Analyst at a corporation. We outline the salary, skills, personality, and training you need for FP&A jobs and a successful finance career. FP&A analysts, managers, and directors are responsible for providing executives with the analysis, information they need to make operational, strategic decisions), equity researchEquity Research AnalystAn equity research analyst provides research coverage of public companies and distributes that research to clients. We cover analyst salary, job description, commercial bankingCommercial Banking Career ProfileA Commercial Banking career path is providing clients with credit products, term loans, revolving lines of credit, syndicated facilities, cash management, or other areas of corporate finance, building financial models is part of the daily routine. Financial models are essentially just tools to help people make business decisions. These decisions often include: whether or not to invest in a company, asset, or security; whether or not to invest in a project (project finance); whether or not to do a merger or acquisitions (M&AMergers Acquisitions M&A ProcessThis guide takes you through all the steps in the M&A process. Learn how mergers and acquisitions and deals are completed. In this guide, we'll outline the acquisition process from start to finish, the various types of acquirers (strategic vs. financial buys), the importance of synergies, and transaction costs), and whether or not to raise money (i.e. an IPOIPO ProcessThe IPO Process is where a private company issues new and/or existing securities to the public for the first time. The 5 steps in an Initial Public Offering are discussed in detail including selecting an investment bank, due diligence & filings, pricing, stabilization, & transition to transition to normal trading); and other corporate finance transactions. The financial model allows decision makers to test scenarios, observe potential outcomes, and hopefully make an informed decision. There is a lot of talk about software programs that can be used, but the truth is, the vast majority of financial modeling takes place in ExcelExcel ResourcesLearn Excel online with 100's of free Excel tutorials, resources, guides, cheat sheets, and more! CFI's Excel resources are the best way to learn Excel on your own terms. These guides and articles teach spreadsheet formulas, shortcuts, and functions step-by-step with screenshots, templates, lessons, guides, and more. Excel is the main tool used by banksBanking (Sell Side) CareersThe banks, also known as Dealers or collectively as the Sell Side, offer a wide range of roles like investment banking, equity research, sales & trading, corporations, and institutions to perform financial modeling. The main reason is Excel’s phenomenal versatility. Every company or investment opportunity is unique, and Excel is a blank canvas that can be totally customized and tailored to the situation. The flip side of this, however, is that there are no controls or rules in place to ensure the model is accurate and error-free. 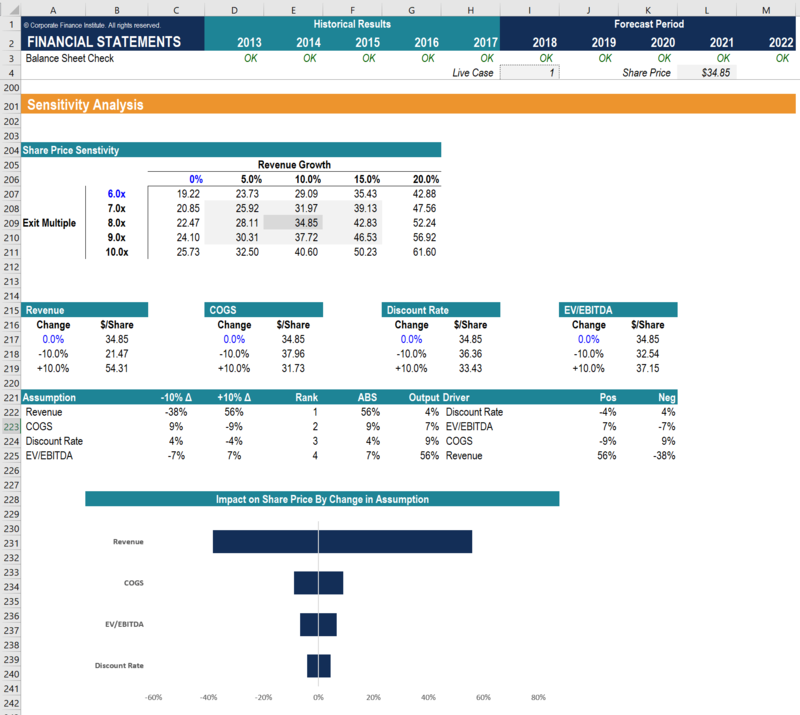 Below is a screenshot from CFI’s Free Excel Crash Course. For a refresher on basic Excel functions check out CFI’s free Excel Crash Course. When you’re ready to take your skills to the next level, the Advanced Excel Formulas course will help you stand out from the pack. Over and above good Excel skills, analysts who really stand out at financial modeling are great at structuring and organizing their spreadsheets. Image: CFI’s Amazon Valuation Modeling Course. The “art” of financial modeling mostly relates to making assumptions about the future performance of the business being modeled. This is the most subjective and important part of the valuation of a company. Top-down analysis. In this approach, you start with the total addressable marketTotal Addressable Market (TAM)Total Addressable Market (TAM), also referred to as total available market, is the overall revenue opportunity that is available to a product or service if 100% market share was achieved. It shows the level of effort and funding that a person or company can put into a new business line. The concept is important to TAM and then work down from there based on market share and segments such as geography, products, customers, etc unit you arrive at revenue. Bottom-up analysis. In this method, you start with the most basic drivers of the businessBusiness DriversBusiness drivers are the key inputs and activities that drive the operational and financial results of a business. Common examples of business drivers are salespeople, number of stores, website traffic, number and price of such as website traffic, then conversion rate, then order value, and finally revenue, in the case of an e-commerce business. Regression analysis. With this type of forecast, you analyze the relationship between the revenue of the business and other factors such as marketing spend and product price by performing regression analysisRegression AnalysisRegression analysis is a set of statistical methods used for the estimation of relationships between a dependent variable and one or more independent variables. It can be utilized to assess the strength of the relationship between variables and for modeling the future relationship between them. in Excel. Year over year growth rate. This is the most basic form of forecasting. Simply use a year over yearYoY (Year over Year)YoY stands for Year over Year and is a type of financial analysis that's useful when comparing time series data. Analysts are able to deduce changes in the quantity or quality of certain business aspects with YoY analysis. In finance, investors usually compare the performance of financial instruments on (YoY) percentage growth rate. We’ve created another detailed guide on how to link the 3 financial statements, but we will also provide a quick recap of it here. Once the forecast assumptions are in place, it’s just a bunch of basic mathematical operations to fill in the three financial statements in the model. From a financial modeling perspective, this is the least subjective part of the process. With the assumptions clearly stated, an analyst more-or-less multiplies, divides, add or subtracts to produce the statements. This is the step-by-step part of the financial modeling guide. Step #1 – Begin by calculating revenueRevenueRevenue is the value of all sales of goods and services recognized by a company in a period. Revenue (also revered to as Sales, Turnover, or Income) forms, based on the forecasting approach used from the above section. From there fill in the cost of goods sold (COGS), gross profit, operating expenses, and arrive at earnings before interest taxes depreciation and amortization (EBITDAEBITDAEBITDA or Earnings Before Interest, Tax, Depreciation, Amortization is a company's profits before any of these net deductions are made. EBITDA focuses on the operating decisions of a business because it looks at the business’ profitability from core operations before the impact of capital structure. Formula, examples). Step #2 – Create supporting schedules for (i) capital assets (PP&EPP&E (Property, Plant and Equipment)PP&E (Property, Plant, and Equipment) is one of the core non-current assets found on the balance sheet. PP&E is impacted by Capex, Depreciation and Acquisitions/Dispositions of fixed assets. 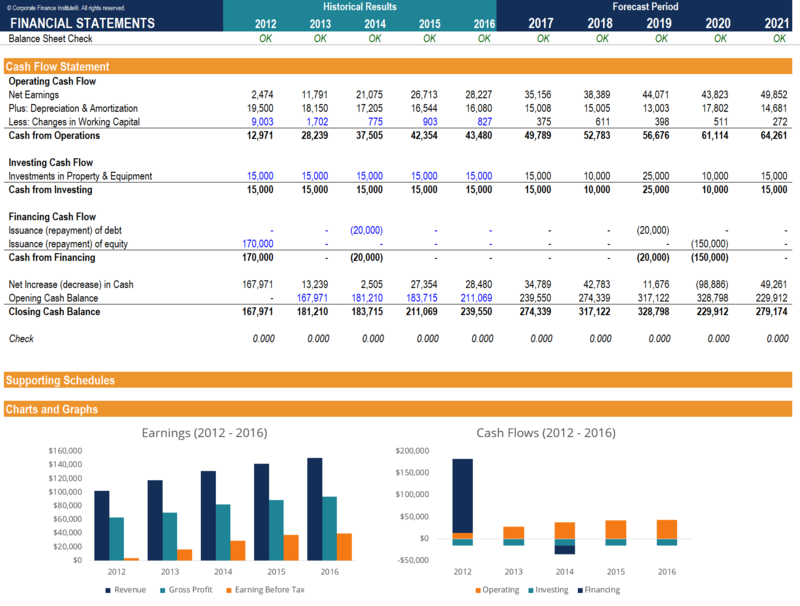 These assets play a key part in the financial planning and analysis of a company’s operations and future expenditures, depreciation, and capital expenditures), (ii) working capitalNet Working CapitalNet Working Capital (NWC) is the difference between a company's current assets (net of cash) and current liabilities (net of debt) on its balance sheet. It is a measure of a company’s liquidity and its ability to meet short-term obligations as well as fund operations of the business. The ideal position is to balances (accounts receivable, accounts payable and inventory), and (iii) financing schedulesDebt ScheduleA debt schedule lays out all of the debt a business has in a schedule based on its maturity and interest rate. In financial modeling, interest expense flows into the income statement, closing debt balance flows onto the balance sheet, principal repayments flow through the cash flow statement, completing the scheudle for equity capital, debt balances and interest expense. Step #3 – Finish the Income StatementIncome StatementThe Income Statement (or Statement of Profit and Loss) shows performance from operations of a business. 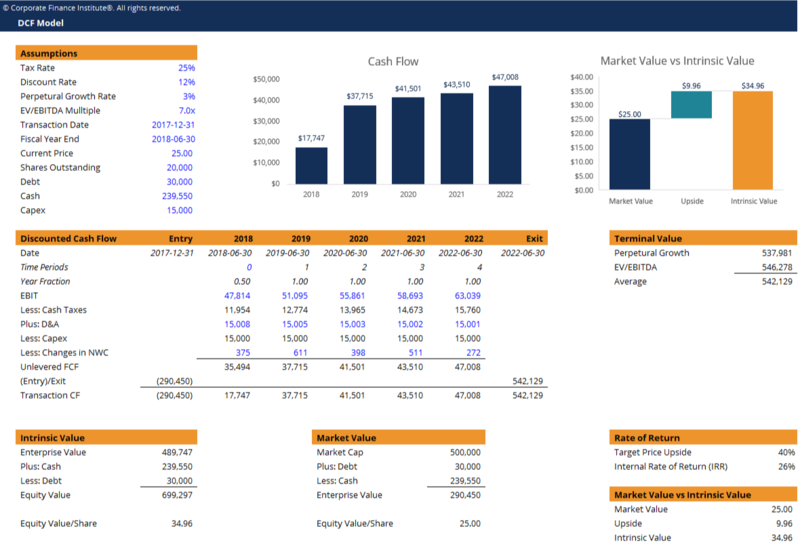 The financial statement begins with revenues and (depreciationDepreciation ScheduleA depreciation schedule is required in financial modeling to forecast the value of a company's fixed assets (balance sheet), depreciation expense (income statement) and capital expenditures (cash flow statement). In financial modeling, a depreciation schedule is requried to link the three financial statements in Excel, interest, taxes, net income) and fill in the Balance SheetBalance SheetThe balance sheet is one of the three fundamental financial statements. These statements are key to both financial modeling and accounting. The balance sheet displays the company’s total assets, and how these assets are financed, through either debt or equity. Assets = Liabilities + Equity items except for cash, which will be the last part of the financial model to be completed. Step #4 – Build the Cash Flow StatementCash Flow Statement​A Cash Flow Statement (officially called the Statement of Cash Flows) contains information on how much cash a company has generated and used during a given period. It contains 3 sections: cash from operations, cash from investing and cash from financing., consisting of cash from operating activities, cash used in investing activities, and cash from financing activities. Combined these three sections will determine the closing cash balance, which links to the balance sheet to complete the financial model. This is a simplified overview of the financial modeling process or linking of the three statements, so please watch our video-based courses on finical modeling if you’d like more detailed instruction. 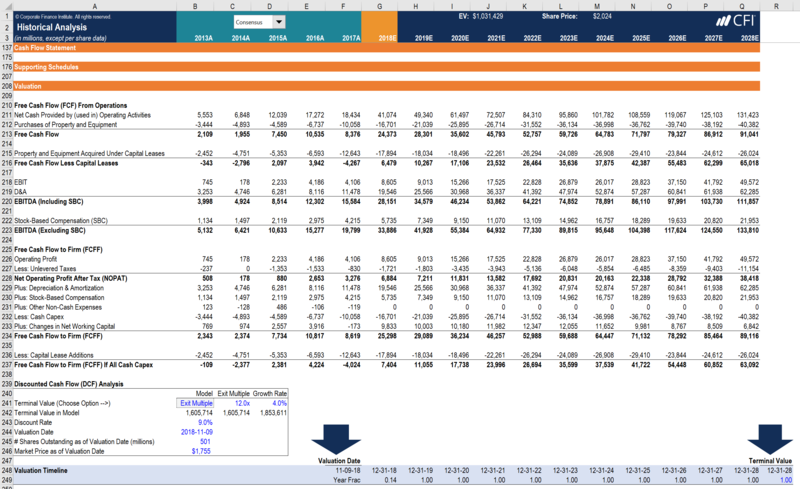 Download this financial model template. With the baseline financial model in place, it’s time to layer on whatever type of financial modeling exercise suits the situation. When all of the above analysis is done, the work still not over. 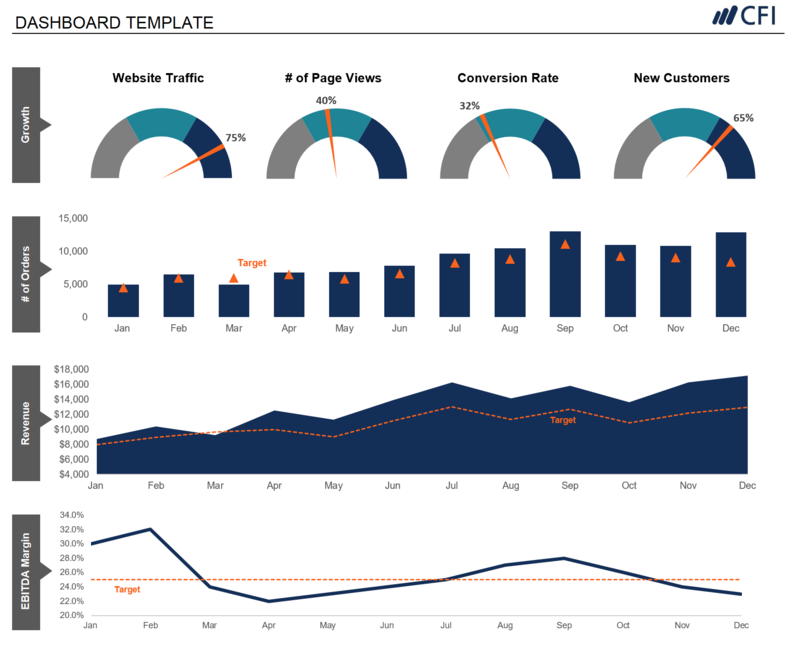 The last step is to develop charts, graphs, and other outputs that can be used to easily communicate the information from the model. This is where the best analysts really get to shine. It’s one thing to build a complex model that only you understand, but it’s another thing to effectively communicate the risks, rewards, and critical factors to all audiences. 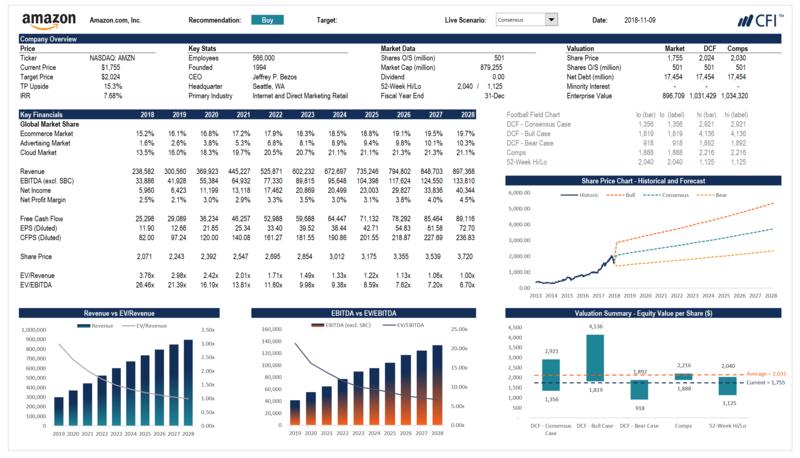 As the capstone for your financial modeling training, we recommend either an advanced Excel course to learn how to build all the best charts and graphs for a presentation, dashboard, or any other document you’re producing. 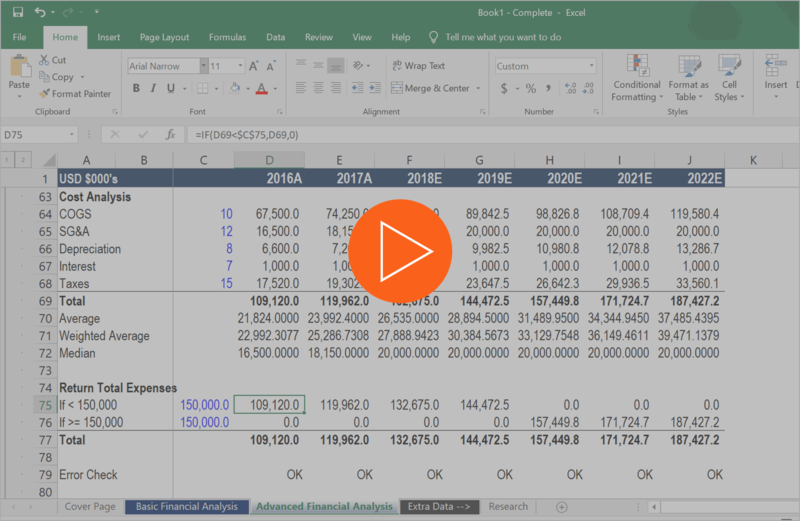 Watch this short video to quickly understand the main concepts covered in this guide, including why building a financial model, Excel tips and tricks, financial modeling best practices, steps to building the forecasts, and presenting the results of financial analysis. We hope this has been a helping guide to financial modeling in Excel and has helped you advance your career as a financial analyst. At CFI, we pride ourselves on creating the best free guides to help you get an edge. To take your skills to the next level, check out CFI’s Financial Modeling & Valuation Analyst (FMVA)®FMVA™ CertificationThe Financial Modeling & Valueation Analyst (FMVA)™ accreditation is a global standard for financial analysts that covers finance, accounting, financial modeling, valuation, budgeting, forecasting, presentations, and strategy. certification program.